The contours are still great for your neck but with the natural material of latex. 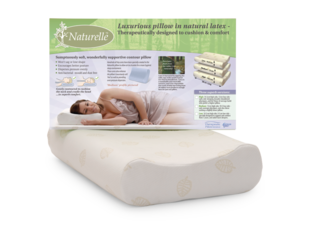 The Naturelle pillow is produced from pure natural latex – harvested by tapping the milk (sap) of the small tropical tree Heavea Braziliensis. *this product has been updated in 2017 and now comes with an adjustable height insert in the bottom that can be zipped out to give you more range between sizes.